Dress: ASOS (also obsessed with this tie front stripe dress). Hat: Eugenia Kim c/o. Bag: Cult Gaia (finally tracked one down!). Shoes: Chanel (similar here). Sunglasses: Celine. Luggage Steamline. I love this drop waist dress! So chic. Wishing you a wonderful weekend! Love your perfect summer dress! Such a chic and retro outfit for a travel day/ weekend getaway! I'm obsessed with your sunnies and luggage! So cute! What a great travel outfit, I'm positively obsessed with your bag!!! This casual dress is so cute, perfect for travelling. Beautiful looks, pictures and glasses! what an adorable suitcase! Very elegant and so unique! I love this whole look! 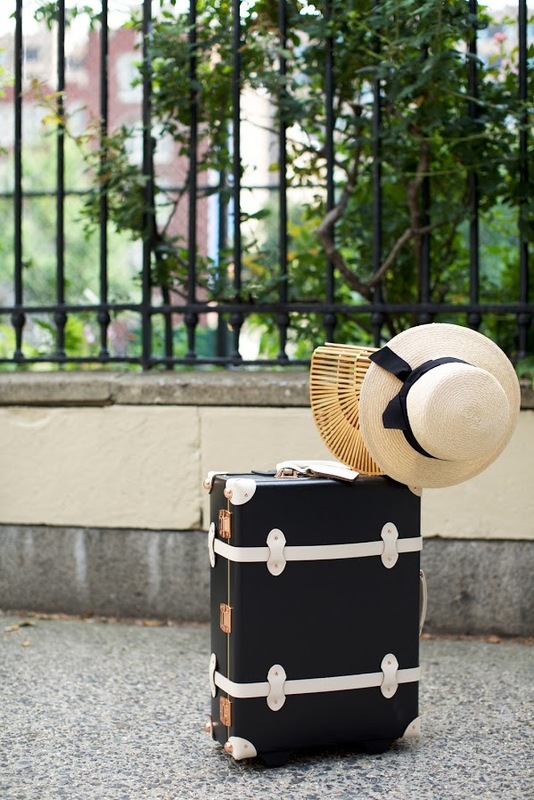 Love your luggage, so chic! Nice stripped dress! Indeed, makes travel mood. I really love your outfit and the location. That look is very inspiring for me and I'm going to look for shop something similar asap! I'm in love with your luggage omg! so chic, love it ? I love this outfit so much! Specially the dress and sunglasses. Wonderful outfit! You look very stylish! Stunning, as usual! I absolutely love this dress; very girly and seems very comfortable. Thank you for linking the bag! I feel in love with it about a month ago when I saw another blogger wearing it, but I couldn't seem to find it.